REALTOR Luncheon at Hillandale in Historic Roswell – Tuesday, March 6th – RSVP Today! Patrick Malloy Communities welcomes you to the REALTOR® luncheon being held on March 6, 2018 from 11:30 am to 1:30 pm. Located in Historic Roswell, priced from the $800’s and inspired by the streetscapes of Charleston, South Carolina, Hillandale is an intimate community of just 36 homes. Catered by Tam’s Backstage Food & Spirits, the eats will be delicious so make your plans to attend. Join us for Shrimp & Grits, Shrimp & Crab Dip, Chicken with Caprino Cheese, Sundried Tomatoes and Basil and Key Lime Pie for dessert! 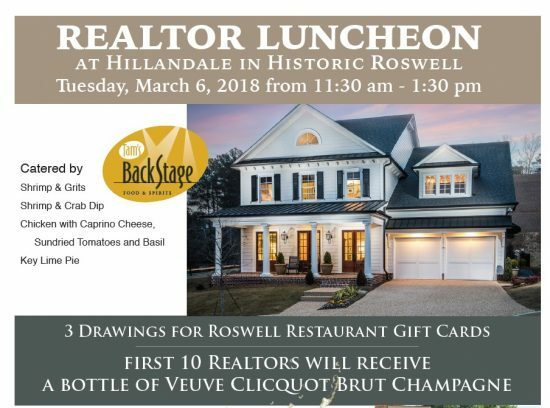 The first 10 REALTORS® will receive a bottle of Veuve Clicquot Brut Champagne and there will be three drawings for Roswell restaurant gift cards. RSVP today at 770-254-5372 or call Jane Turner at 404-838-1762 or visit our website. Next Next post: Spring is Almost Here! Choose Your Basement Home at Cambridge Preserve with FREE Partially Finished Basement! ACT FAST!